The Mayor has found a Magic Word. 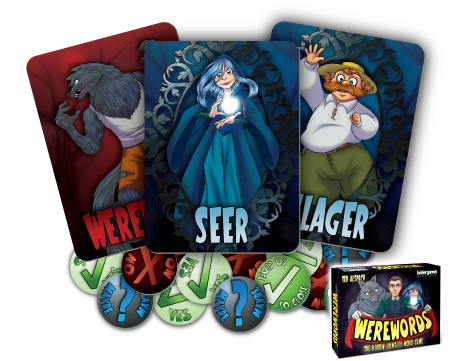 If everyone says it together, the Werewolves will be driven from your village forever! However, the power of this Magic Word has rendered your Mayor speechless; he may only answer yes/no questions with tokens. 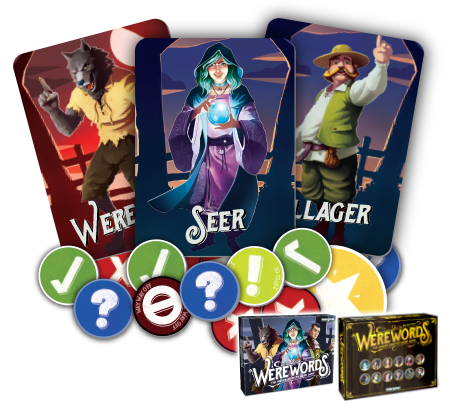 Your Seer knows the Magic Word, but she must hide from the Werewolves already among you. And somehow, those dastardly Werewolves also know the Magic Word, and want to prevent you from learning it. A Werewolf howls in the distance. You have only four minutes to discover the Magic Word, protect your Seer, and save your village!